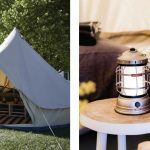 We think that you’ll get the most from the festival if you’re camping close to the action in one of our three powered campsites: Family Camping, Quieter Corner or Party Animal. All have plenty of power for your techy toys! If camping is not your thing – we understand – and we have you covered with an option to add dorms during your registration for a bargain price of $200 for the whole weekend of up to 3 nights. 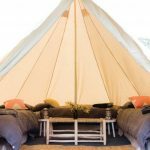 Back by popular request, we’ll be giving you the option to camp in luxurious style with a range of ‘glamping’ options again this year. They are styled by a professional interior stylist with pure linen, chic yet rustic furniture and bright finishes. 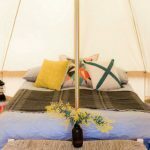 It is our aim to bring you the joy of sleeping in a beautiful canvas tent amongst nature without all of the effort – let us take care of it for you. 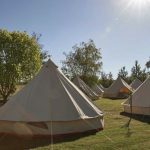 Prices start at $670 for three nights – with a small surcharge for additional beds up to 4 per tent – making them a very economical way for a group to stay onsite!